As it is still freezing at the moment, I feel that gives me full license to call this post winter white. Can’t wait until it starts getting warmer. Really want to transition from boots to flats and sandals. Anyway, all white outfits in the winter are one of my big obsessions. There’s something so great about the refusal to wear a dark outfit and instead embrace white and light clothes. I realise I’m wearing black boots and a white coat here so we’ll just have to wait until next winter when I finally get my hands on the white winter coat of my dreams. Although it’s freezing, it’s actually quite bright out on the way to work. I hate squinting when it’s bright out so I got these great sunglasses in Topshop last week. The jeans are high waisted and cropped from Topshop called Jamie. The tee is Isabel Marant Etoile, coat is Zara and the boots are Topshop. I also threw on a big jumper leaving the house so I wouldn’t freeze on the commute. Just in case any of you think I’m mad wearing just a tee. 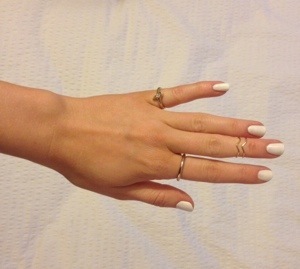 I love white manis, they’re so simple to do and always look really fresh. A couple of rings and I’m ready to go. Look out for my styling post on the My UNiDAYS blog, The Edit and my round up post of NYFW is coming soon! Love your rings. Where are they from?